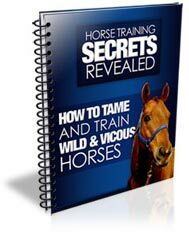 Below is a list of some of the most common questions we get regarding horse training. If you do not see your question here, please contact us to get your question answered. How Old Does A Horse Need to Be Before I Can Ride It? Normally, most horses are not ridden until they are at least 3 years old. This is because the horse needs to have time to strengthen their tendons and connective tissue to prevent future injuries. Some people start riding horses at 2 years of age, but they normally start with a very light-weight person so they don't risk injuring their horse. There are two common answers to this. Some people feel that the best bonding experience starts shortly after the horse has been born. They believe that separating the foal from it's mother (for short periods of time) will cause it to bond closer to you. These people generally start boding with the horse a few days after it is born. Other people feel that separating a horse from it's mother can cause stress in the foal, so they generally have limited contact until the horse is several months to a year old. What's the Most Important Thing to Teach A Horse? By far, the most important thing you need to teach your horse is to never fear or attack humans. Horses need to feel safe around humans and view them as a non-threat so they can be safe around anyone.